And what a super view it is! The East window has been re-installed and timed perfectly for Easter. Alleluia indeed! Capronnier’s work looks stunning and for the first time in a generation we can see its full glory. Our thanks go to Jonathan and Ruth Cooke whose skilled craftsmanship and meticulous organisation have achieved this. Their attention now moves to the West window at the base of the tower and to the remaining windows which are in need of attention. All works should be completed by the end of the summer. 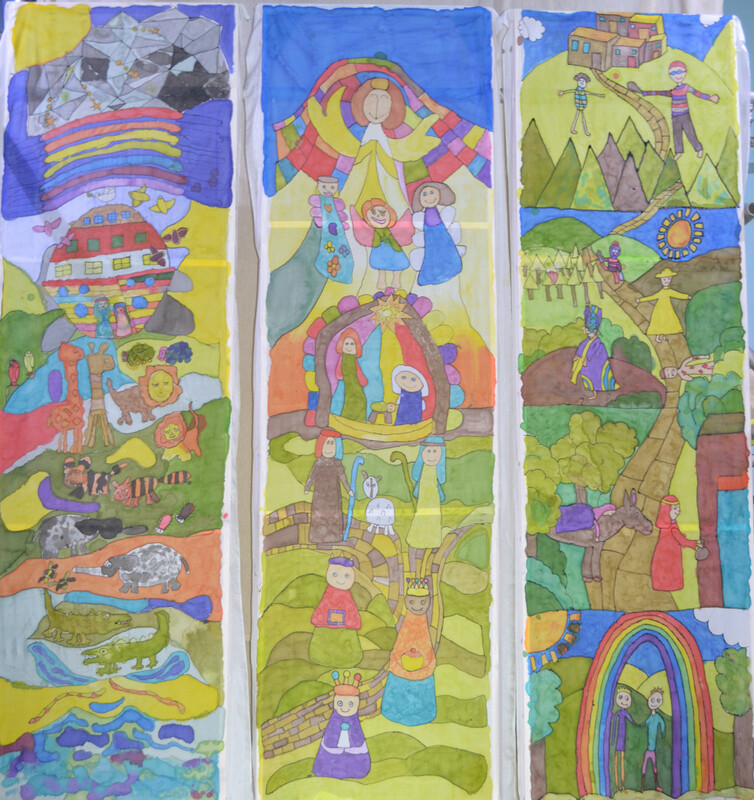 During the recent months the children and teachers at Embsay school have been working on designs for seven panels of painted silk which represent familiar scenes from the Bible. We were fortunate to have Noah, the Nativity and the Good Samaritan holding our attention in front of the scaffolding which covered the East window. These panels have attracted a wealth of praise and they add richly to the interest and diversity of St Mary’s. We plan to share the seven panels in rotation with the school so that they can become more permanent features of our church. We owe a big “Thank You” to all at the school, as well as members of St Mary’s, whose hard work and attention to detail have made these so successful. Southern Africa Appeal: the collection over recent weeks raised £284 which has been forwarded to Christian Aid. Thank you to all those who contributed. The May walk will now happen on Saturday 4thMay and NOT on Sunday 5th, on account of a Tour de Yorkshire on the Sunday. The walk starts at 2.00pm from St Mary’s Car park. Liz has further details. The Monday Prayer Group: Please talk to Daphne for more information. Bookshop in a Box:do have a look at the Lent and Easter books by the pulpit which are all from Cornerstone Bookshop and are for sale today. Mary Dibb will assist you with this. The Vicarage Phone Number:Louise’s phone number at the vicarage has been discontinued. Contact details for Tim and the churchwardens are published on the website, in Embsay News and will soon be updated on the signboard by the church gate. Easter Lilies:Every year we decorate the church with lilies bought in memory of someone you have loved, whose names are read out on Easter Day as we receive Communion. Pam Meakin is in charge of this – please let her know on if you would like to pay for one or more lilies. The cost is £3.50 per lily. The East window is due to be reinstalled on Monday April 15th, the scaffolding will move to the window at the west end and we should be able to enjoy the glory of Capronnier as a backdrop to our Easter celebrations. April 15th-17thThe East window is re-instated, and the scaffolding moved to the West end. Maundy Thursday service and watch. 10.30-12-30 workshop open to all. Easter Vigil and service of Light. Family Celebration for Easter Day. Sunday 9thJune at 2.00pm Joint walk to Bolton Priory, starting at St Mary’s. and everyone is invited to come and light a candle in prayer. Our main Sunday service is Communion at 9.30am. On the first Sunday of the month we have All Age Worship at 9.30am followed by a Communion Service at 11.15am. Morning Prayer is said every weekday at 8.30am. There is a short service of Holy Communion on Tuesdays at 10.30am. We call this Quiet Communion as there are no hymns. Tuesday Teas takes place between 2 and 4pm every Tuesday, when tea, coffee and cake are served. Smiley Faces, our Toddler Praise group, takes place on Fridays in term time between 1.45 and 3.15pm. Coffee, tea, juice and biscuits are served after the 9.30am service every Sunday, and after Quiet Communion (10.30am) on Tuesdays. What's on at St Mary's: view this week's news-sheet. A wheelchair and ramps are available to assist access. Please ask a member of the congregation.